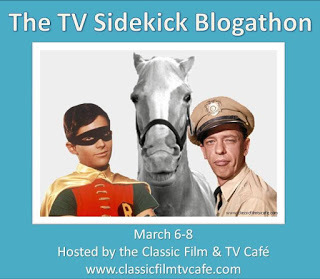 With apologies to Mitchell Hadley of the excellent (and highly recommended by yours truly) blog It's About TV, I'm going to take an excursion into what is normally his territory with a look back at a classic issue of TV Guide. 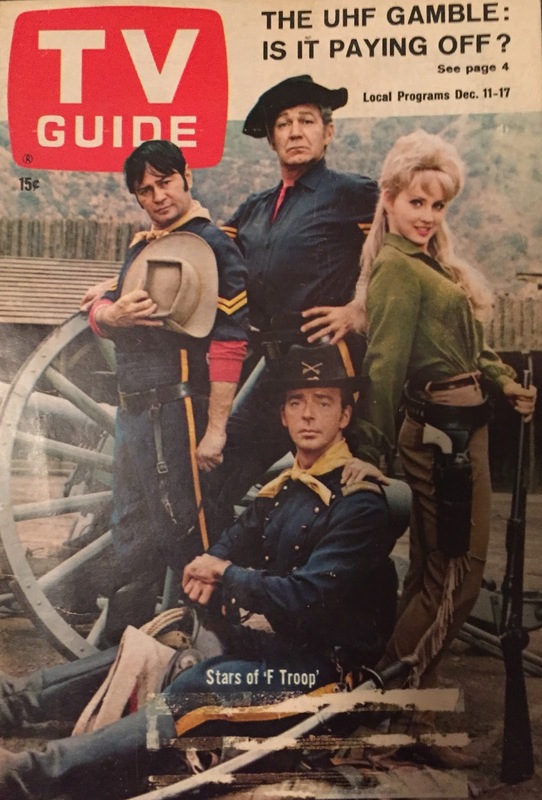 It was 50 years ago this Friday that television's all time greatest series, F TROOP, made the cover of the venerable U.S. television weekly for the first time. 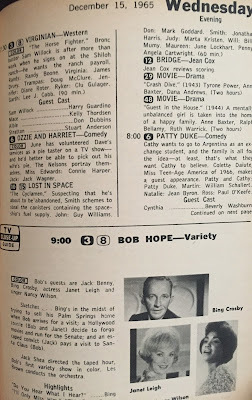 F Troop would soon be overshadowed by the smash mid-season replacement Batman (which debuted January 12, 1966) but at the time of this issue, it was ABC's biggest new hit of the 1965-66 season. 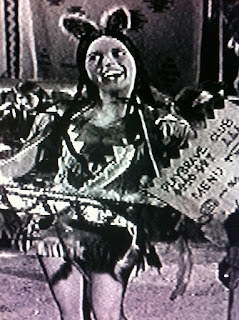 Airing in what had been a death slot for ABC (Tuesdays at 9 PM ET) since the turn of the decade, F Troop managed to stand its ground and then some. 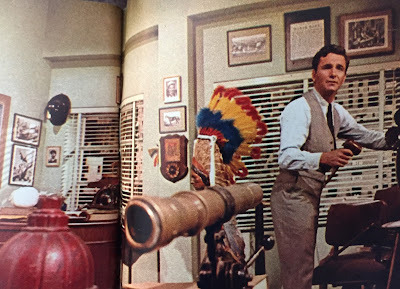 In fact, the episodes Scourge of the West, Don't Look Now, One of our Cannon Missing and Old Ironpants cracked the Nielsen top 10 despite airing opposite CBS' seemingly invincible The Red Skelton Show. 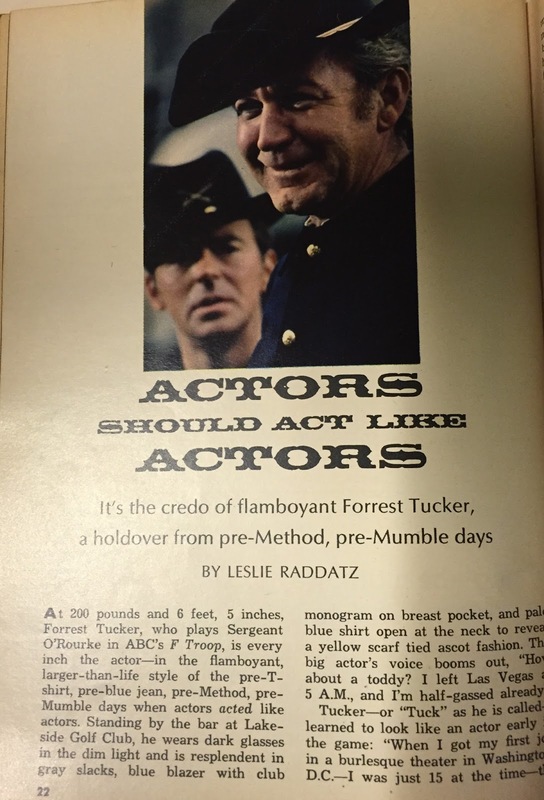 It's series star Forrest Tucker who is the subject of this cover story, profiled by Leslie Raddatz (whose tenure at the weekly lasted from 1962 to 1976). 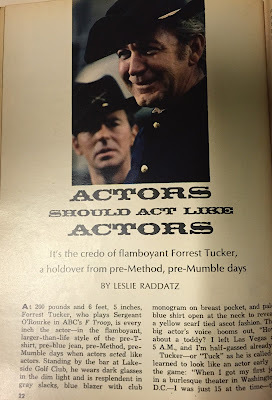 Actors Should Act Like Actors is the title of Raddatz' article and also our patron saint's credo. 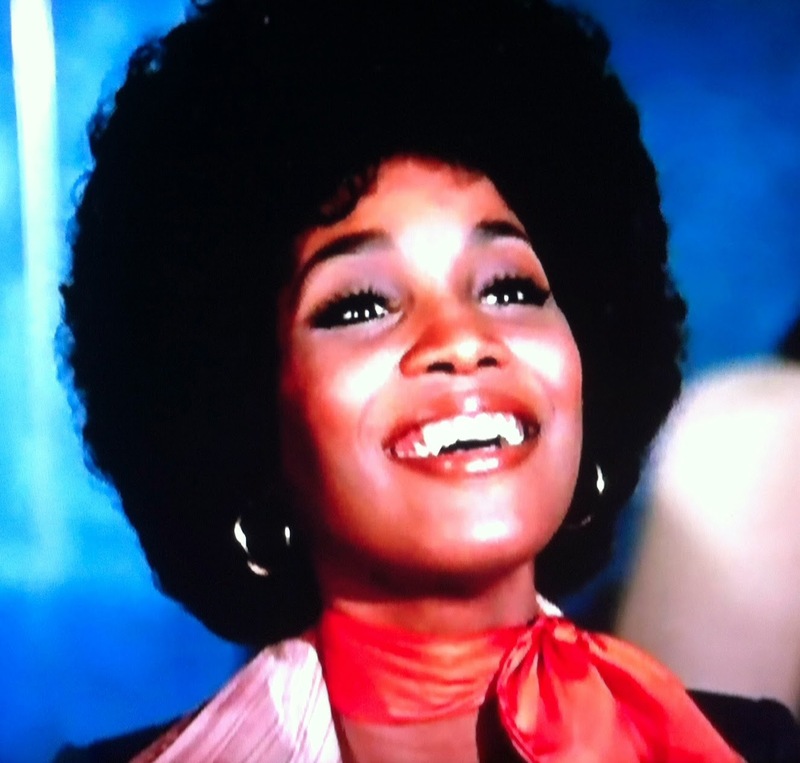 Tuck learned it from his early show business mentor, Jimmy "Carnation" Lake, who unknowingly hired a fifteen year old Forrest to emcee at the Old Gayety burlesque theatre in Washington, D.C. Whether this happened circa 1930 or circa 1934 depends on the source: Raddatz gives Tucker's birthdate as February 12, 1915 (though 1919 is the most widely reported year). The interview takes place at Tuck's longtime favorite hangout, the Lakeside Country Club, so it isn't surprising that the star's prowess at golf gets almost as much mention as his chosen vocation. Tuck's apartment is three blocks from Warner Brothers' backlot and from Lakeside, and he often drives from place to place in his customized golf cart. While Tucker probably played more rounds at Lakeside than anywhere else, we learn that it wasn't the site of his greatest round ever (at least, as of late 1965)--a stellar 9-under-par 63 at a pro-Am in Stockton. Professionally, Tuck's long run as Professor Harold Hill onstage in The Music Man (2,008 performances from 1958-1963) gets prominent mention in Raddatz' article. 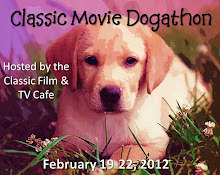 "The part is so tough you have to spend all of your time between shows lying down. For four years I saw nothing but the theatre and a ceiling." 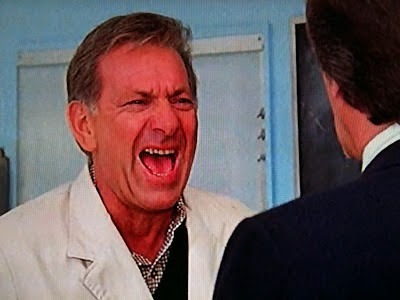 Tucker is perhaps overly modest about a career on the big screen that at the time included 91 feature film credits: "I never really made it in pictures--I was the other guy, the one who didn't get the girl." (Not always, Tuck!) 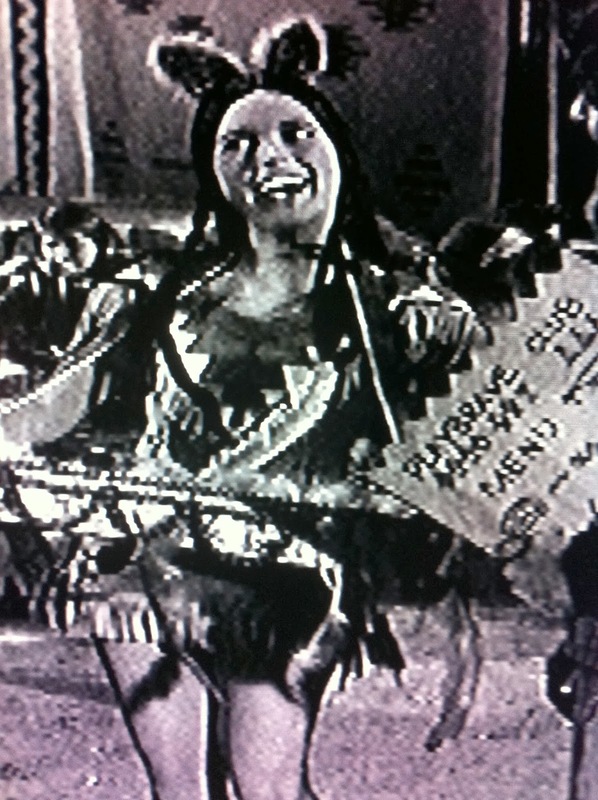 Marilyn Fisk is his third wife ("I like dancers because of their discipline") and ends up making three appearances on F Troop. The other cover story involves what, in 1965, was still being referred to as the UHF Gamble. 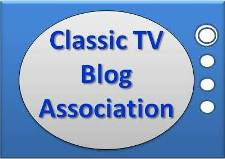 The All-Chanel Receiver Act of 1962 had gone into effect in May 1964, requiring all television manufacturers to include UHF tuners so that channels 14 through 83 could be received by the public. David Lachenbruch's article looks at this "$200,000,000 Experiment" (the rough estimate of the added cost of said UHF tuners) after the first eighteen months. More than 35 percent of the nations estimated 53.8 million households "already have at least one set" that can access the additional 70 channels. Independent producer David L. Wolper (Get Christie Love!) was prescient: "Another network will be formed. It's inevitable now that the stations are there." He's far from the only prognosticator proven correct about where television would be headed: more choices, more programming variety. KWEX-TV in San Antonio "saw the light almost from the beginning", broadcasting 14 1/2 hours a day "for the last ten years". Thus began what we now know as Univision. WKBD in Michigan carries University of Michigan sports along with the Pistons and Red Wings in prime time. ESPN, of course, was still fourteen years away. Lachenbruch concludes that the all-channel experiment "cannot yet be called a success" but notes that UHF broadcasters insist that it must succeed, for the sake of television's future. For the record, my issue, covering the Philadelphia area, carries listings for a mere by modern standards nine stations: 3 UHF independents (17,29,48); one UHF CBS affiliate (15), educational Channel 12, and four more network affiliates, with last-place ABC having only one (6) to the two for both NBC (3,8) and CBS (10,15). Two stars whose best days were ahead of them also have articles about their respective shows that didn't survive the 1965-66 season: Peter Falk's Trials of O'Brien and Sally Field's Gidget. 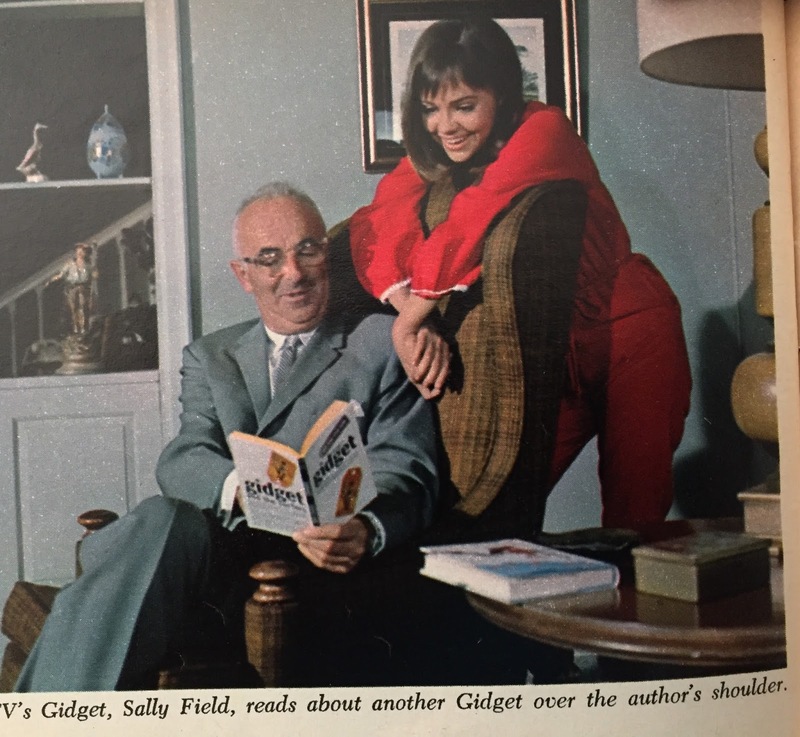 ABC cancelled Gidget but had Field back on the air more successfully in 1967 as the star of The Flying Nun. 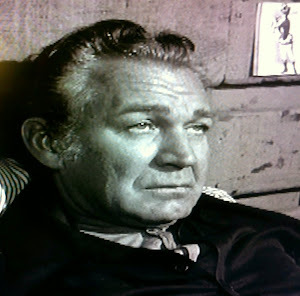 Falk would begin his epic run as Columbo in the 1968 TV-movie PRESCRIPTION: MURDER. 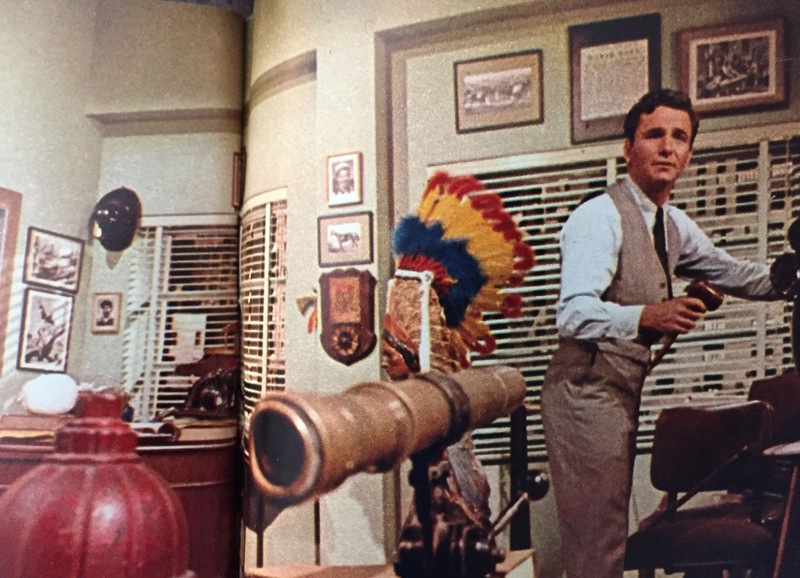 One can see elements that Falk would bring to that iconic portrayal in lawyer Daniel J. O'Brien's office, though none of these props could compare with that raincoat. 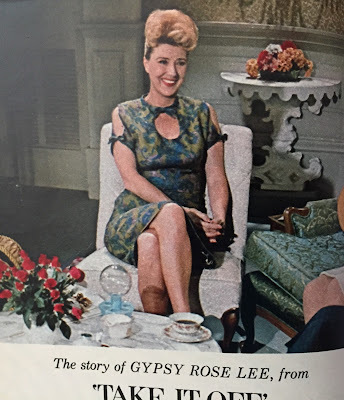 Capping off an issue with most impressive star power, Charles E. Alverson interviews the legendary Gypsy Rose Lee, former burlesque queen and now host of her own syndicated TV talk show based in San Francisco (where it airs on WCO-TV). Alverson reports that the transition from "take it off!" 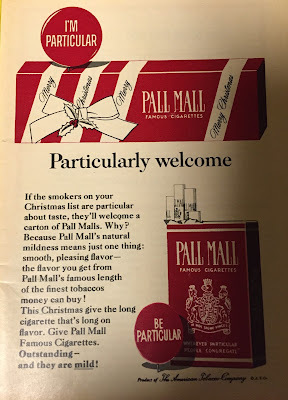 to "keep them talking!" hasn't been without its problems. Used to being the interviewee, she started out "rattling away for the whole show". The three page profile isn't the most flattering: "there are few signs that Miss Lee has given up running her guests off the conversational road". Alverson almost grudgingly concludes that despite the problems, Miss Lee "can so far rest easy", since she has fans ranging from John Wayne to the secretary of a chapter of the Hell's Angels, "a band of California bike riders often in the headlines". KCO-TV was an ABC affiliate, and Gypsy Rose Lee would make appearances on the network's Batman and The Pruitts of Southampton the following year. 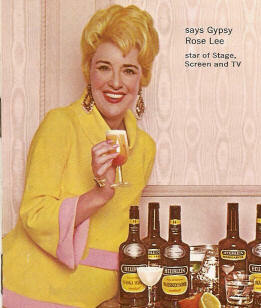 She died in 1970. Rounding out the feature articles, Pep Pills for Dr. Kildare, reviews NBC's attempt to reinvigorate its aging hit. "Romance and a format change" didn't work; the doctor was out after this fifth season. Inside: For The Record reports that ABC expects to debut two hour-long British TV series in the summer. 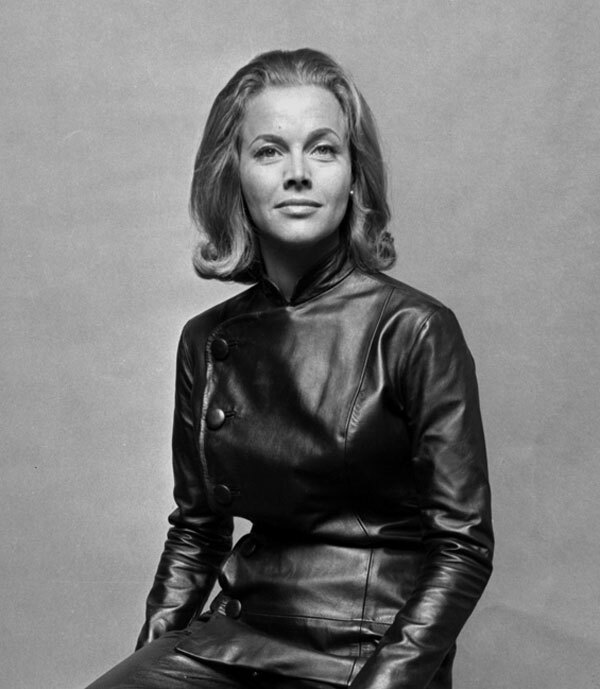 The Avengers, noting that "Honor Blackman stars on British TV, but she won't be in the version shown here". No mention whatsoever of Patrick MacNee or then-current costar Diana Rigg! The second, Court-Martial, is far less remembered despite the bigger American name in Peter Graves, already familiar then from Fury and about to score his signature TV role in Mission: Impossible. 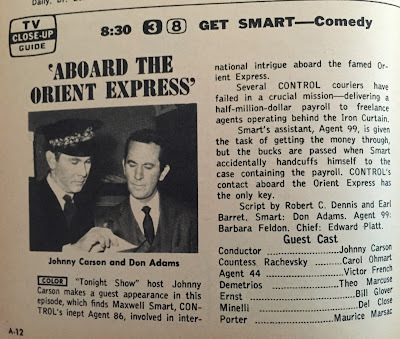 The British imports were two for two at hitting prime time, a much better batting average than the four reported projects from the "Comeback Quartet" for 1966-67: Phil Silvers in Help (Bilko as a chauffeur), Pat Boone in The Perils of Pauline (with Pamela Austin in the titular role) and 74 year old Lowell Thomas' planned documentary series all failed to make the schedule. 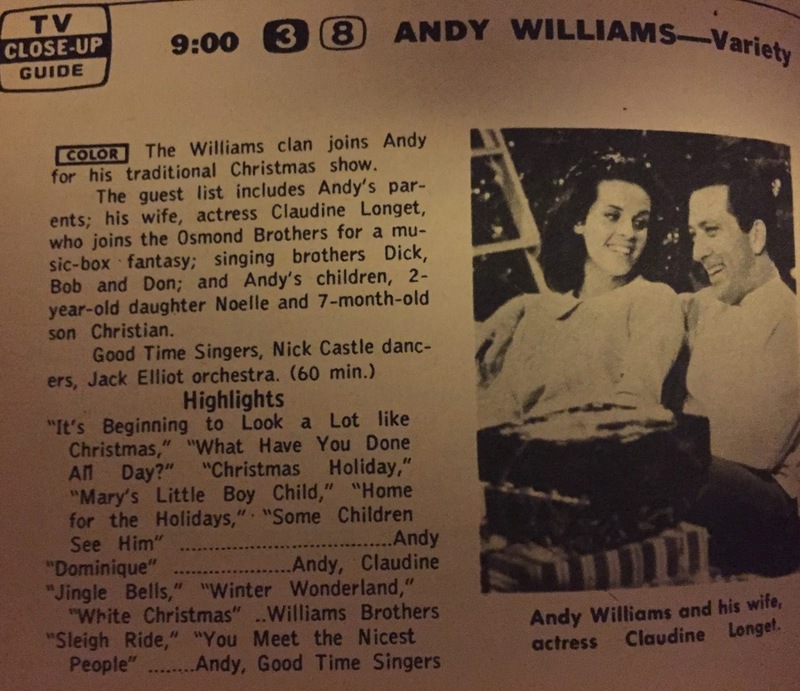 Only the return of The Garry Moore Show did, and thanks to competition from Bonanza, it barely lasted into 1967. 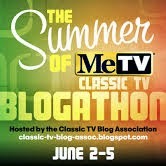 One last note, Roger Miller and Jonathan Winters are both "under consideration" for a summer series by NBC. 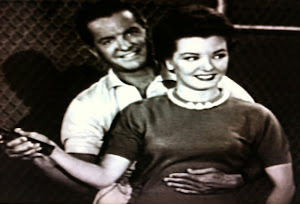 Miller ended up on the network's fall schedule in 1966, and Winters made it onto CBS' the following year for a two year run. 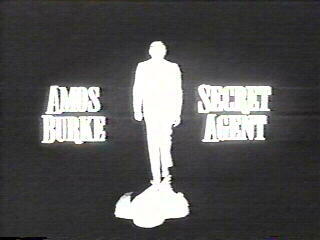 Interesting letters as always, with one blasting the unsuccessful format change for Amos Burke: Secret Agent (formerly Burke's Law, and off the air three weeks later) and two panning the salute to Stan Laurel that had aired on CBS November 23rd. Perhaps most interesting of all is the opinion of V. Smith from Hamilton, Ontario: "Since playing Las Vegas, Johnny Carson's head has certainly swelled. He is not nearly as interested in his guests as he is in setting his facial expressions for the camera. Merv Griffin has him beaten by miles." While Griffin didn't quite match Carson's run, The Merv Griffin Show had 21 more years to run, not far behind Carson's 27. Palace: Host Caterina Valente, Bill Cosby, Bill Dana as Jose Jimenez, Herb Alpert and the Tijuana Brass, Brazilian guitarist Luis Bonfa, magician Channing Pollock, the Black Theatre of Prague (pantomimists) and the Freedonias (German tumblers). Sullivan: Alan King, Al Hirt, Barbara McNair, Wayne Newton, the Swingle Singers (who adapt jazz styles to classical music), clown/juggling troupe The Gomberts and the Bratislova Slovokian Folkloric Company. Alpert and the Brass play two songs from the legendary Whipped Cream and Other Delights LP, Valente gets four songs, Cosby does a presumably shortened version of "$75 Car" from his Why is There Air? LP, and Dana's Jose is a flamenco dancer. It's enough to outweigh Hirt and McNair for me, so I'm going with Palace. Besides, Caterina Valente is much easier on the eyes than Alan King. 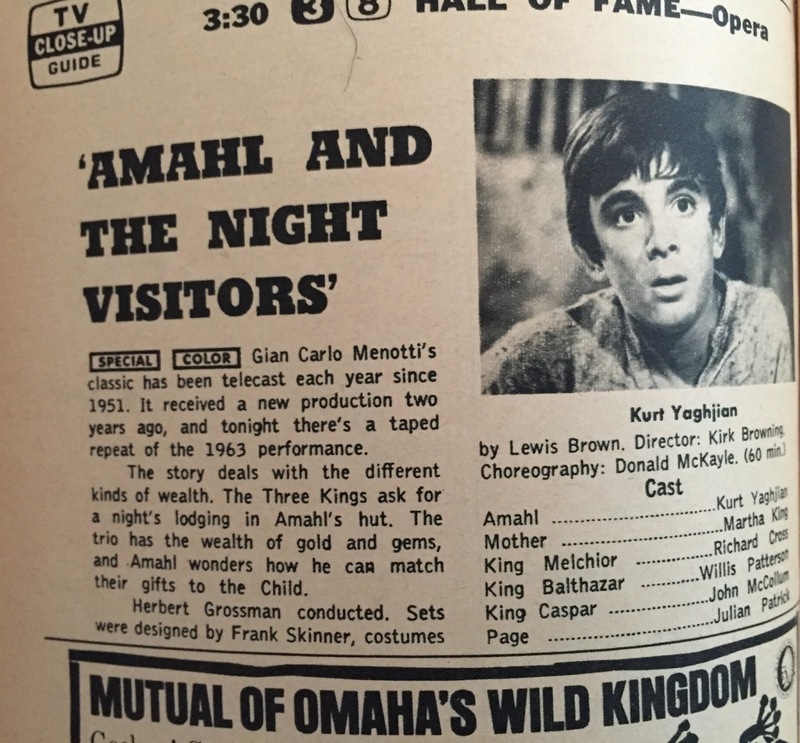 On Sunday, the annual rerun of Gian Carlo Menotti's opera Amahl and the Night Visitors (first telecast live in 1951 as the very first Hallmark Hall of Fame) is NBC's counter-programming to the football games on CBS and ABC. This is a taped repeat of the 1963 production, and the last before the TV rights reverted back to Menotti in May 1966. 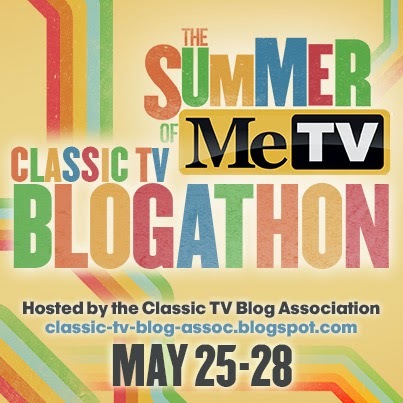 Menotti, who never approved of the 1963 version, refused to allow it to be rebroadcast again. 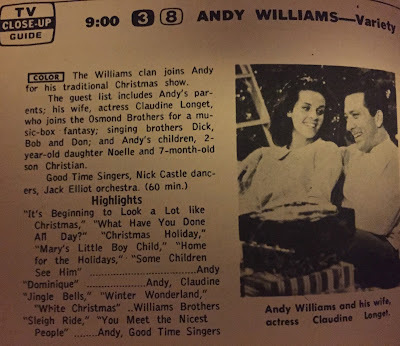 The seasonal mood is being built on Monday night with the annual Andy Williams Christmas show, with Andy's special guests The Osmonds. The aforementioned David L. Wolper also gets a TV Guide Close-Up for his ABC documentary airing at 10:00, In Search of Man. 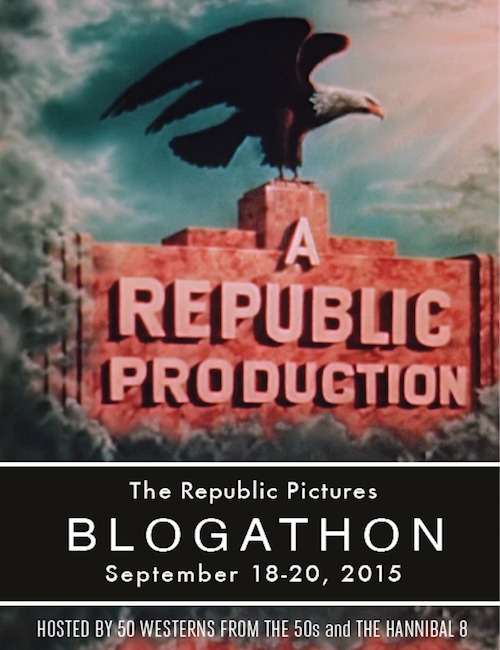 Van Heflin narrates. 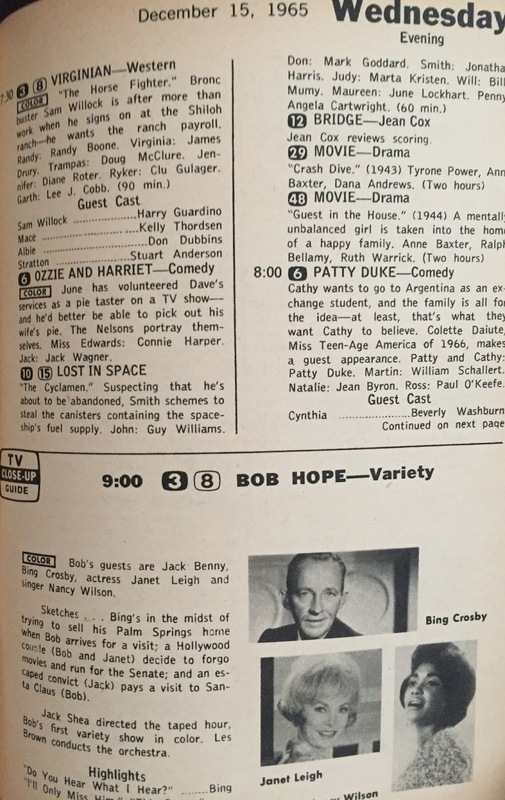 The Bob Hope Comedy Special gets Wednesday night's Closeup, bringing the star power with Jack Benny, Bing Crosby, Janet Leigh and singer Nancy Wilson joining Bob. Probably a top draw, especially with Benny having given up his series after 15 years the preceding season. There's no review from critic Cleveland Amory this issue, though Thursday night's listing for Amory's creation (with Abe Burrows) O. K. Crackerby includes a blurb that the critic will discuss the show's failure in next week's issue. 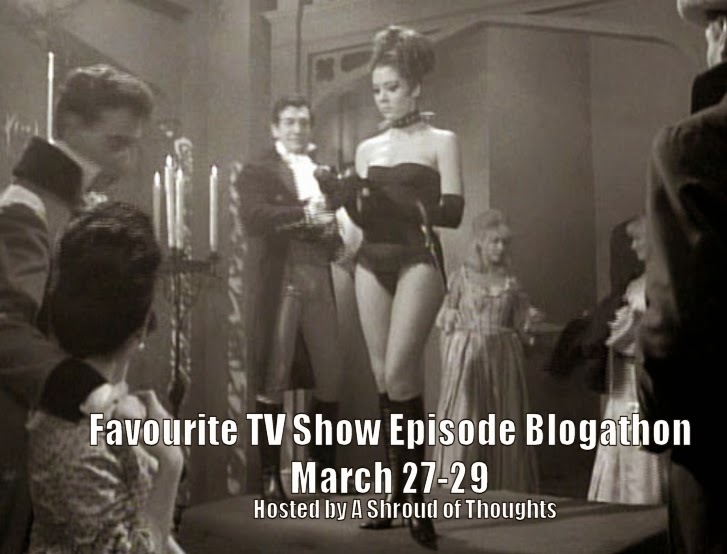 Crackerby, which starred Burl Ives, has only three episodes left after tonight's installment guest starring Aliza Gur, Miss Israel of 1960 and a finalist in that year's Miss Universe pageant. 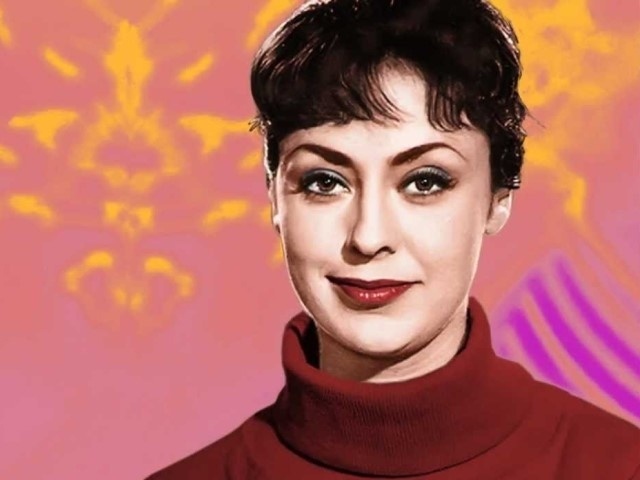 Aliza Gur was a popular guest star in 1965-66, popping up on six different series, including the aforementioned Amos Burke just four weeks earlier in an episode entitled Deadlier Than the Male. 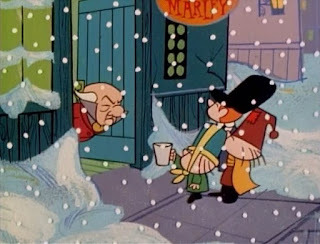 Capping off the week, low-rated Camp Runamuck and Hank are pre-empted by NBC Friday night for Mr. Magoo's Christmas Carol. 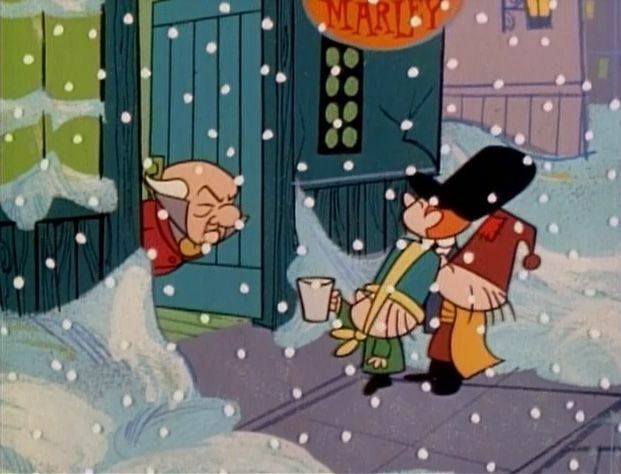 As always, Jim Backus is Magoo and Jack Cassidy voices Bob Cratchit. 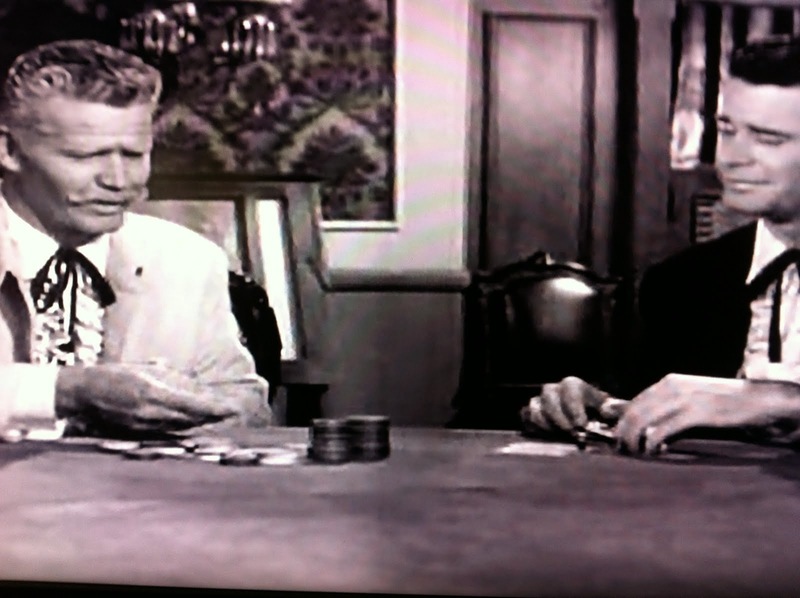 It's a repeat, having first aired in 1962. 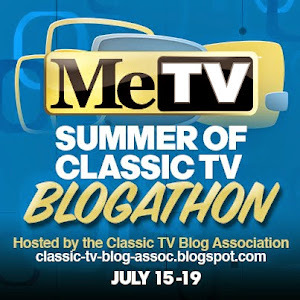 Magoo goes head to head with ABC's long-running The Flintstones, and this week Fred and Barney are utilizing robot doubles to go bowling and take their wives out simultaneously. 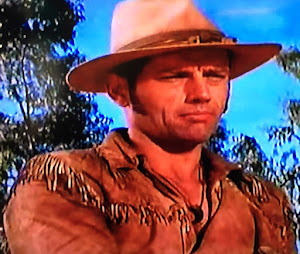 If you dislike cartoons, The Wild, Wild West still airs as usual on CBS. 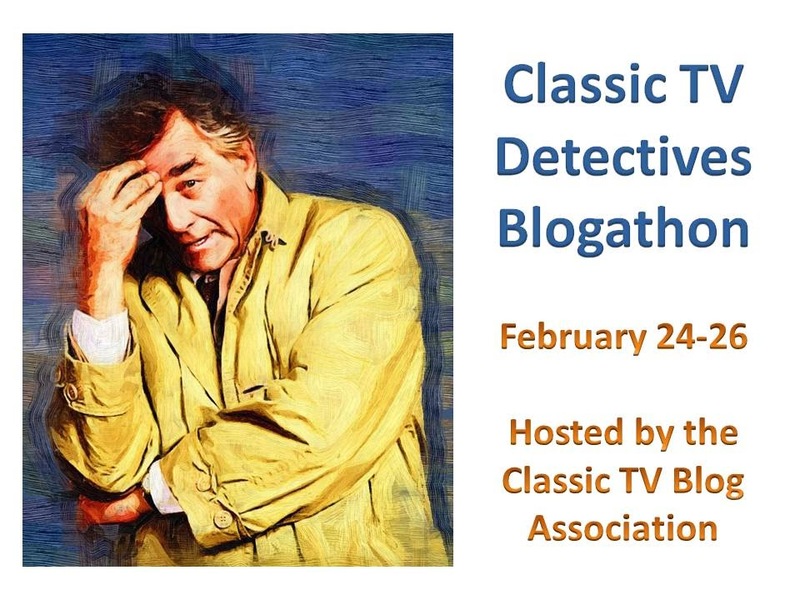 Before we leave Friday and the listings: The Trials of O'Brien has two of the longest running TV sleuths of all time facing off, as Peter Falk is joined by guest star Angela Lansbury. No review from Cleveland Amory this week. Vacation, or mourning that cancellation of O.K. Crackerby? If that doesn't get you into the Holiday spirit, nothing will! 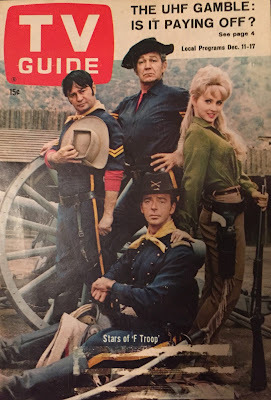 F Troop had two more TV Guide covers in its future, so hopefully this is the first of a trilogy here at the Section. And if you like vintage TV Guide reviews, It's About TV has a new one each Saturday, and you'll find one periodically at Retrospace also. Many thanks for the kind words, Hal - and even more thanks for the excellent writeup! Some great, great pictures here; it really gives a flavor not only of the week, but of the times in general. Looking forward to more!